Thousands of gallons of spilled soda flooded several blocks just south of the Coca-Cola facility. 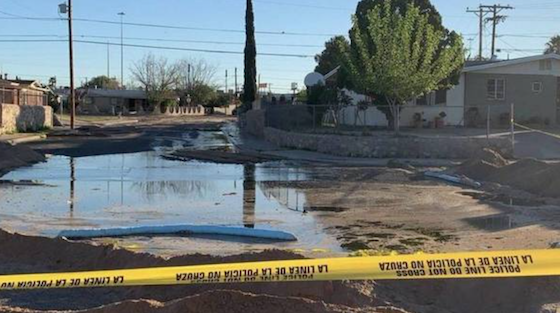 Thousands of gallons of Coca-Cola spilled into the El Paso, TX, streets Tuesday and officials are now cleaning up the sticky mess. The spill, which took place at 10:30 p.m. Tuesday at the local Coca-Cola facility, hit several blocks just south of the facility and even seeped into homeowners’ yards and properties. A city employee said crews had contained the soda, though it was Coca-Cola’s job to remove the sludge. Early on Wednesday, cleanup crews mixed the soda with dirt in order to make it easier to remove. A representative for Coca-Cola was not immediately available to confirm what caused the spill, though some officials said they believe the soda came up through a drainage system. By morning the flooded soda had receded, leaving residents with Coke sludge in their yards. But the only other Coke-flood victim was a bird that got trapped, but was then cleaned and then it flew off.